Beachwalker County Park provides public access to the beach on Kiawah Island. The rest of the island has been developed into a private resort community that bars non-residents and non-guests from entering. The beach is also accessible via boat at any time. All beaches in South Carolina are publicly-owned up to the high-water mark. However, many upscale beaches prevent outsiders from entering by blocking roads with gates. Located at the west end of the island, Beachwalker County Park offers pristine views of the Atlantic Ocean and Kiawah River (seen above). Visitors can walk further west and reach Captain Sam’s Spit, one of the most ecologically significant spots in the South Carolina Lowcountry. Here one can witness dolphins strand-feeding. Other wildlife, like shorebirds, water fowl, deer, and even bobcats are present as well. Lifeguards are on duty seasonally to watch over swimmers, and the park offers restrooms, outdoor showers, picnic areas with grills, a seasonal snack bar, and boardwalk trails. Dogs are allowed but should be on a leash. 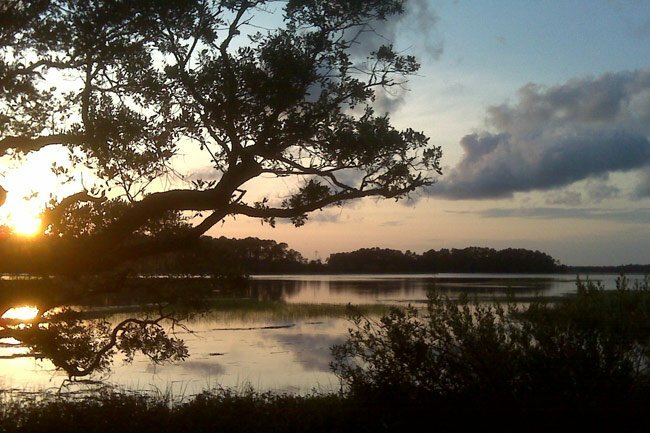 This photograph of Beachwalker Park, submitted by Melanie Thomas of Johns Island, won our South Carolina Swimming Holes” photo contest in July 2009.